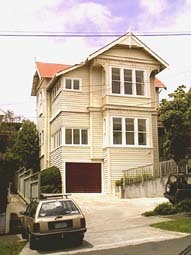 In 1999 the Lions Liver Transplant Unit Appeal Committee purchased this house, known as "Transplant House" in Grafton, Auckland. It is now owned and operated by the Lions Transplant House Trust, which is a charitable trust. The Lions Transplant House Trust is independent of both the Lions and the New Zealand Liver Transplant Unit. Clients of the Trust are Liver Transplant Recipients and their Caregivers. It was opened by the Prime Minister in December 1999, and since then has been the "home away from home" for more than ten families. There is no charge to the Liver Transplant recipient or their caregiver. The average stay is 8-10 weeks, although some have been as long as six months. is able to accept donations. The Trustees are wanting to start a "Friends of the House", so if you are interested in joining this, please contact the Trust at the postal address below. If you are advised by the New Zealand Liver Transplant Unit that you will be staying at Transplant House, you only need to bring your own food and clothes. All three apartments are fully furnished in terms of kitchen fittings and utensils, beds and bedding, and there is plenty of storage (with excellent wardrobe space) as well as a television, video and stereo in each flat. There is an upstairs laundry in the bathroom of Flat 2, however Flats 1 and 3 have laundry facilities in the garage. The telephone is on business rates, so you will need to bring a Telecom / Clear Calling Card. Have a look at some photos here. There is a Link Bus service that takes you on an inner city loop. The Link Bus stop is about 2 minutes from Transplant House. Buses turn up every 10 minutes during the week, and every 20 minutes on the weekend. Link Buses are all clearly marked. Transplant House is conveniently located within 3-5 minutes walk of Auckland Hospital. The time varies according to the traffic on Park Road, which you have to cross, to get to the hospital. Supermarkets are available on the Link Bus route, with New World near Victoria Park Market, and For those with a car and a Foodtown card, there is a Foodtown in Valley Road, Mt. Eden. A cheaper alternative, for those with cars, is Pak'n'Save in Royal Oak. If you have computer access, you can use Countdown (online) Home Shopping, who deliver. For those recipients from the South Island, without their cars, ask either the Transplant House Manager or the Transplant Coordinator, whether there are any Liver Transplant recipients within Auckland who are available to take you on outings or to the supermarket. There are a number of recipients in the Auckland area who have noted their desire to assist you with the Liver Transplant Coordinators or the Social Worker. Here is a copy of the Introduction to Staying at Transplant House from the House Manager. Read the story of Murray and Karen Wakelin, of Christchurch, called Our Stay at Lions Transplant House. If you are a member of the RSA, there is a local Newmarket branch within walking distance where you can get a good economical meal and talk to people not concerned with health. When you first arrive, find a Dentist and a Doctor for yourself as Caregiver, in the local area, that you are comfortable with. It is hard work once you are sick, and your Liver Transplant Recipient is unwell, to arrange this. If you run your own business, remember to bring all Bank Statements, Passports, Birth Certificates etc with you. You may be delayed longer than you expect in Auckland, and you may need access to these documents in order to take care of your business interests. When Transplant House is full, the New Zealand Liver Transplant Unit accommodates transplant recipients and their caregivers in Domain Lodge, around the corner.